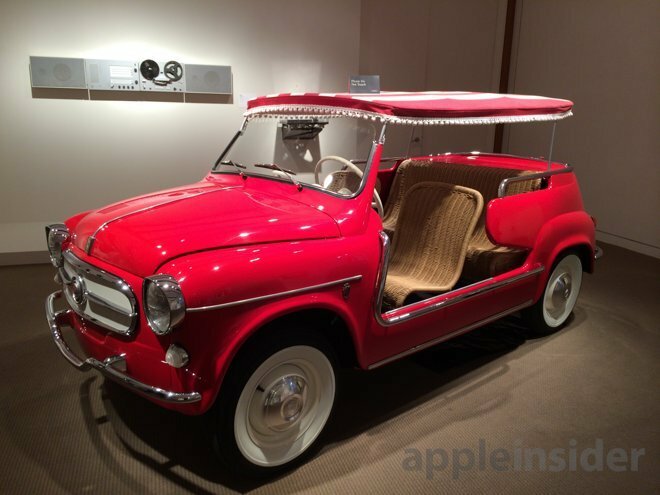 A Fiat 600 customized by Apple designers Jony Ive and Marc Newson for a charity auction in 2013. Marchionne on Saturday said his California pit stop included meetings with Cook, Tesla boss Elon Musk and others, reports Reuters. The FCA chief also took a ride in Google's self-driving car during his trip. As for Apple's automotive ambitions, Marchionne refused to comment in detail, saying only that Cook is "interested in Apple's intervention in the car, that's his role." Publicly, Apple fields one major automobile-related initiative in CarPlay, an iOS-based in-car infotainment system designed to connect with and harness iPhone's communications, entertainment and navigation capabilities. In March, Cook said all major automakers are on board and will collectively roll out integration across 40 car models this year. A number of FCA subsidiaries have pledged support for Apple's solution, including Alfa Romeo, Chrysler, Dodge and the RAM Trucks brand, Fiat and its Abarth-badged performance line, and Ferrari. Together, the company's brand presence accounts for more than 20 percent of all CarPlay partners. Marchionne's recent meeting with Cook adds fuel to rumors of a so-called "Apple Car," an electric vehicle said to be in development under the codename project "Titan." Hard evidence of such efforts has yet to surface, though Some have attributed mysterious vans carrying advanced sensor packages to Titan. It is more likely that these Apple-registered vehicles are part of an unannounced effort to bolster Apple Maps with ground-level imagery. However, an AppleInsider investigation recently revealed Apple is running a secret automotive project out of unmarked buildings in Sunnyvale, Calif., where multiple warehouses are outfitted with garage and repair facilities. Interestingly, one of the buildings loosely linked to Apple, but officially leased by a company named "SixtyEight, LLC.," imported a red 1957 Fiat Multipla from the UK, the same model car Apple SVP of Design Jony Ive and Marc Newson customized and auctioned off for charity in 2013.